In June 2012, the Supreme Court issued a brief, unsigned order reversing a Montana Supreme Court decision that declined to apply Citizens United v. FEC1 to a state campaign-finance statute.2 Commentators described the Court’s refusal to use American Tradition Partnership v. Bullock to even consider overturning Citizens United3 as “disappointing,”4 “a missed opportunity,”5 and a “mistake.”6 What the decision should not have been was a surprise—not only in its substance, but in its form. American Tradition Partnership is entirely consistent with the Roberts Court’s use of summary disposition—the dispensation of a case without briefing or oral argument—to oversee, manage, and shape the output of lower courts. In the weeks leading up to the decision, Adam Liptak wrote in the New York Times that the “main question” would be “how the court will reverse the Montana decision.”7 But even that question offered little suspense: American Tradition Partnership presented a perfect vehicle for summary reversal, especially for the Roberts Court, which has not hesitated to use summary disposition to send signals about its legal commitments and priorities.This Essay offers a brief description of summary disposition, presents data on its use at the Roberts Court, and examines three ways in which that Court has used summary disposition. Although the Court has not, contrary to some commentators’ suggestions, used summary disposition more than its predecessors, it has begun to use it differently. Summary disposition is a procedural innovation, added belatedly and briefly to the Supreme Court rules. The Warren and Burger Courts conducted experiments with the tool—the Warren Court by reversing lower courts without explanation, the Burger Court by providing reasons and opportunities for lower courts to handle their own affairs. The Roberts Court, though, has embraced the tool in two novel ways: remanding cases to lower courts without having identified clear error, and reversing complex, fact-bound cases without having called for briefing. In doing so, the Court has increasingly acted in what this Essay describes as a managerial capacity, potentially to cope with an ever-increasing flow of certiorari petitions. But there may be consequences: a form of judicial carelessness in which summary disposition is used not simply to manage and oversee lower courts’ dockets, but—contrary to tradition and reason—to make new law. Summary orders, which simultaneously grant certiorari petitions and affirm or reverse the judgment below without explanation. These opinions are often issued per curiam (“by the Court,” or unsigned). Summary opinions, which simultaneously grant certiorari petitions and affirm or reverse the judgment below with explanation, usually a brief discussion of the facts and issues involved. These opinions are also generally issued per curiam. Summary disposition at the Supreme Court presents a puzzle. Appellate courts generally act in two capacities: a lawmaking capacity, in which they “announce, clarify, and harmonize the rules of decision employed by the legal system in which they serve”;14 and an error-correcting capacity, in which they “determine if prejudicial errors were committed” in applying those rules to facts.15 But it is well established that the Supreme Court “is not, and has never been, primarily concerned with the correction of errors in lower court decisions.”16 And summary opinions—although capable of making law—are poorly suited to the task, because they are not the products of merits briefing and oral argument. The best way to understand summary disposition—and, this Essay argues, the way that the Robert Court does understand it—is as a tool to manage and oversee the docket of lower courts. Summary disposition presents concrete advantages for a high court facing a rising tide of petitions from lower courts, as the Supreme Court currently is.17 By issuing GVRs, the Court can ensure that more lower-court decisions take account of intervening precedent without the Court spending its own time and energy on cases that pose similar issues. By issuing summary opinions, the Court can send signals about its commitments and priorities, even on settled areas of law, by illustrating particularly egregious misapplications. In other words, summary disposition allows the Court, acting in its managerial capacity—rather than its lawmaking or its error-correcting capacity—to dispose of more cases with less effort, to correct egregious legal errors when they arise, and to preserve the Court’s limited resources for cases that present novel legal problems. But it also presents disadvantages. Summary orders that dispose of lower-court judgments without explication—although rare today—result in fewer and less intelligible legal principles for litigants and lower courts to consider. Summary opinions risk significant unfairness to litigants, who have not had the opportunity to submit merits briefing on their cases. Perhaps most disturbingly, summary consideration of all kinds may lead to “erroneous or ill-advised decisions,”18 because the Court, in making its decision, will not have benefited from merits briefing or oral argument. The costs of summary disposition are not insubstantial—especially if used to do more than apply well-established legal principles to new circumstances. The thrust of those discussions has been the volume of summary dispositions: from Liptak to Russell, commentators have expressed concern that the Roberts Court is more likely than its predecessors to consider and decide cases summarily. The data, however, cast doubt on such speculation. The 2009 Term that alarmed Russell, in which the Court ultimately issued fifteen per curiam reversals of lower courts, was an outlier. In the previous three Terms (2006, 2007, and 2008), the Court issued four, four, and six such reversals, respectively, and in the subsequent Term it issued only seven. 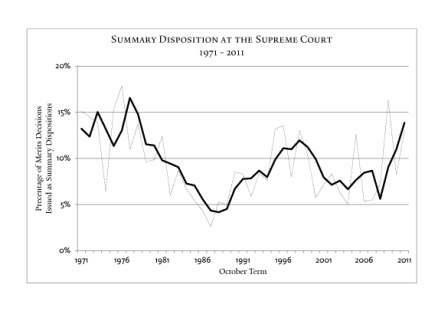 More broadly, while the proportion of per curiam dispositions (measured as a percentage of overall merits dispositions) has risen slightly over the first seven Terms of the Roberts Court—from eight percent in its first year to just under fourteen percent23—only in 2009 did it approach the levels it reached during the Burger Court, when it topped sixteen percent.24 The Roberts Court has not summarily disposed of cases on the merits more often than its predecessors did. The Court has, however, summarily disposed of cases in a different way from what its predecessors did. The Warren Court became known for an unusually aggressive approach to summary disposition: in sixteen Terms, the Warren Court issued over 250 decisions reversing lower courts with “no more than a citation or two by way of explanation.”25 Some reversals contained no explanation whatsoever.26 The Burger Court, almost certainly in response to criticism of the Warren Court’s approach to such cases,27 all but eliminated the summary order from the Court’s toolkit and reinstated the Court’s practice of remanding cases to lower courts for consideration.28 The Roberts Court has continued to use the Burger Court’s tools—the GVR and the summary order—but has, acting in its managerial capacity, expanded the use of those tools to cases that the Burger Court would not have considered appropriate vehicles for summary disposition. First, the Roberts Court has expanded the use of summary reconsideration orders (or GVRs) for cases that once would not have warranted them, because the underlying opinions neither rely on a recently changed legal premise nor present clear error. The Court has expanded its use of the GVR in absolute terms as well: in its first seven Terms, the Roberts Court remanded, on average, more than 110 cases per Term to the lower courts “in light of”30 an intervening development—almost twice as often as the Burger Court did in the 1975 to 1979 Terms,31 and outnumbering, in most Terms, the number of cases disposed of on the merits. (By contrast, the Burger Court never issued more GVRs than signed opinions, and usually issued fewer than half as many.32) This volume is explained in part by United States v. Booker,33 which held that the Federal Sentencing Guidelines were not binding on federal courts; the 2005, 2006, and 2007 Terms saw the Court hold—and then remand—hundreds of cases in light of Booker and its progeny.34 But even the more recent post-Booker Terms—2008, 2009, and 2010—saw more than sixty GVRs issued each Term, well above the Burger Court’s average. This revolution in the Court’s GVR jurisprudence is not exclusively a product of the Roberts Court,46 but the Court under Chief Justice Roberts has continued and expanded it.47 Because these cases do not rely on changed premises but merely (potentially) faulty ones, other Courts might not have considered the GVR an appropriate tool to use. And because they do not, in general, present important questions of federal law or involve clear error (just potential error), other Courts might not have granted review at all, leaving the lower courts’ decisions untouched. The Roberts Court, however, has expanded the use of the GVR, a procedural innovation, to increase its influence over the lower courts, both federal and state. It has, in other words, acted neither in its lawmaking capacity nor—entirely—in its error-correcting capacity, but rather in its managerial capacity. In remanding in search of error, the Roberts Court has signaled a new era of management and oversight within the judicial system. Finally, in some instances the Roberts Court has used summary disposition in cases that present contested questions of law. Although such cases are presumably ripe for Supreme Court review, at least if they present “important question[s] of federal law,”63 they are presumably not appropriate candidates for summary disposition. Indeed, Justices from a variety of ideological backgrounds have agreed that summary disposition is improper when “employed to change or extend the law in significant respects.”64 Because these cases are perhaps most likely to benefit from the “adversarial presentation that full briefing and argument afford,”65 they are well-suited to plenary review. The Roberts Court, which in some instances has embraced the use of procedural tools to manage and oversee the lower courts, has almost certainly not consciously extended summary disposition to cases that present contested questions of law. But cases like Presley, Spears, and Wilkins illustrate one consequence of a court increasingly comfortable acting in its managerial capacity: the risk of carelessness. A Court comfortable with issuing GVRs and summary opinions in cases it might otherwise have declined to review may also be more likely to issue summary opinions where they are simply inappropriate, because they “make new law.”74 This critique is not altogether new; in 1982, Justice Stevens accused the Court of mismanaging its discretionary docket, “encourag[ing]” rather than “resist[ing] . . . the rising administrative tide,” by issuing an “ever-increasing” stream of per curiam opinions.75 But it has surely never seemed more apt than today, when the Court does more than ever to curate the docket of lower courts. The risk of judicial carelessness is certainly controllable. Justice Marshall once argued that, “when the Court contemplates a summary disposition it should, at the very least, invite the parties to file supplemental briefs on the merits, at their option.”76 Alternatively, a mandatory practice of demanding the full record from lower courts in fact-sensitive cases—which the Court does not always do—would reduce some risk of erroneous adjudication. The Court could adopt a more potent rule similar to the one adopted by the federal appellate courts,77 and simply limit its use of summary disposition to cases in which all Justices, or at least a “supermajority” (e.g., seven of nine), agree that it is warranted.78 This approach might reduce the likelihood that the Court would overturn highly fact-sensitive decisions of lower courts, as in Cavazos; it would almost certainly reduce the likelihood, though, that the Court would actually create new law. Arguably, it is exactly this—the opportunity for a minority on the Court to demonstrate that the law is less settled than a majority believes—that a supermajority rule would protect. A supermajority rule would probably not have prevented the Court from ultimately overturning the decision of the Montana Supreme Court: Justice Kennedy’s vote did not appear to be in doubt. But it would have continued a conversation over a question that a full third of the Court thought was not yet settled. It would, moreover, have required the Justices in the majority to check their understanding of the law against the best arguments of the bar and the bench to the contrary. The purpose of this Essay is not to argue against summary disposition, for the benefits of a managerial approach are clear. But the risk of error is equally clear—and the benefits of debate, especially in cases important enough to warrant review, are not insignificant. If the Court is to continue to act in its managerial capacity, it should consider how it uses the tools at its disposal. Alex Hemmer is a member of the Yale Law School J.D. Class of 2014 and an editor of The Yale Law Journal. The author is indebted to Linda Greenhouse for her encouragement and to Bridget Fahey, Lauren Thomas, and the staff of The Yale Law Journal Online for their helpful feedback. Preferred citation: Alex Hemmer, Courts as Managers: American Tradition Partnership v. Bullock and Summary Disposition at the Roberts Court, 122 Yale L.J. Online 209 (2013), http://yalelawjournal.org/forum/courts-as-managers-american-tradition-partnership-v-bullock-and-summary-disposition-at-the-roberts-court. Am. Tradition P’ship, Inc. v. Bullock, 132 S. Ct. 2490 (2012) (per curiam). Henry v. City of Rock Hill, 376 U.S. 776, 777 (1964) (per curiam). Paul D. Carrington, Daniel J. Meador & Maurice Rosenberg, Justice on Appeal 3 (1976). Harris v. Rivera, 454 U.S. 339, 349 (1981) (Marshall, J., dissenting). Hellman, supra note 15, at 822. Hellman, supra note 15, at 824-25. See Hellman, supra note 11, at 391. See id. at 392 (describing the GVR as “a polite form of reversal”). 547 U.S. 867 (2006) (per curiam). Id. at 872 (Scalia, J., dissenting). 554 U.S. 911 (2008) (per curiam). 130 S. Ct. 456 (2009) (per curiam). 130 S. Ct. 727 (2010) (per curiam). Wellons is one of few GVRs accompanied by an opinion. 132 S. Ct. 2 (2011) (per curiam). Id. at 12 (Ginsburg, J., dissenting) (citing Kyles, 514 U.S. at 460 (Scalia, J., dissenting)). Cavazos v. Smith, 132 S. Ct. 2, 12 (2011) (Ginsburg, J., dissenting). Cavazos, 132 S. Ct. at 8-9 (Ginsburg, J., dissenting). 130 S. Ct. 721 (2010) (per curiam). 130 S. Ct. 1175 (2010) (per curiam). Schweiker v. Hansen, 450 U.S. 785, 791 (1981) (Marshall, J., dissenting). Bunkley v. Florida, 538 U.S. 835 (2003) (Rehnquist, C.J., dissenting). Bd. of Educ. v. McCluskey, 458 U.S. 966, 972 (1982) (Stevens, J., dissenting). See, e.g., Montana v. Hall, 481 U.S. 400, 410 (1987) (Marshall, J., dissenting). Am. Tradition P’ship, Inc. v. Bullock, 132 S. Ct. 2490 (2012) (Breyer, J., dissenting). For instance, the Court could have entertained arguments that intervening developments had altered that case’s factual premises. Press Release, Rep. Nancy Pelosi (June 25, 2012), http://www.democraticleader.gov/news/press/pelosi-statement-supreme-court-ruling-upholding-citizens-united. Garrett Epps, Court to Super PACs: Full Speed Ahead, Am. Prospect, June 25, 2012, http://prospect.org/article /court-super-pacs-full-speed-ahead. Press Release, Brennan Ctr. for Justice, NYU Sch. of Law, Supreme Court Lets Unlimited Money Stand, Ignores Extensive Record of Corruption (June 25, 2012), http://www.brennancenter.org/content/resource/supreme_court_lets_unlimited_money_stand_ignores_extensive_record_of_corrup. Adam Liptak, Mystery of Citizens United Sequel Is Format, Not Ending, N.Y. Times, June 11, 2012, http://www.nytimes.com/2012/06/12/us/in-citizens-united-ii-how-justices-rule-may-be-an-issue-itself.html. Sup. Ct. R. 16.1. This provision was codified in 1980. See Eugene Gressman et al., Supreme Court Practice 342 (9th ed. 2007). Justice Scalia, on today’s Court, and Justices Marshall and Stevens, on previous Courts, have criticized the Court’s use of summary disposition. Justice Scalia has argued that in certain circumstances it is ultra vires. See, e.g., Youngblood v. West Virginia, 547 U.S. 867, 872 (2006) (Scalia, J., dissenting) (decrying the Court’s decision to vacate and remand “in light of nothing”); Price v. United States, 537 U.S. 1152, 1153 (2003) (Scalia, J., dissenting) (arguing that the Court “ha[s] no power to vacate a judgment” not in error). Justice Marshall argued that the practice was unfair to litigants. See, e.g., Montana v. Hall, 481 U.S. 400, 405 (1987) (Marshall, J., dissenting) (arguing that summary disposition “deprive[s] the litigants of a fair opportunity to be heard”). Justice Stevens argued that the practice cut against the Court’s traditional standards for granting certiorari. See, e.g., Florida v. Meyers, 466 U.S. 380, 385 (1984) (Stevens, J., dissenting) (arguing that summary disposition “pose[s] disturbing questions concerning the Court’s conception of its role”). The Court’s opinions in all of these cases were per curiam. See, e.g., Gressman et al., supra note 8, at 342 (describing summary disposition as “controversial”); Ernest J. Brown, The Supreme Court: 1957 Term—Foreword: Process of Law, 72 Harv. L. Rev. 77, 95 (1958) (arguing that the Court should “limit the number of [certiorari] selections to the number of cases to which it can give a hearing commending itself as fair and a consideration commending itself as adequate”). The GVR practice has received considerable academic attention. See, e.g., Arthur D. Hellman, “Granted, Vacated, and Remanded”—Shedding Light on a Dark Corner of Supreme Court Practice, 67 Judicature 389 (1984). More recent discussions of the GVR process can be found in Aaron-Andrew P. Bruhl, The Supreme Court’s Controversial GVRs—and an Alternative, 107 Mich. L. Rev. 711 (2009); Shaun P. Martin, Gaming the GVR, 36 Ariz. St. L.J. 551 (2004); J. Mitchell Armbruster, Note, Deciding Not To Decide: The Supreme Court’s Expanding Use of the “GVR” Power Continued in Thomas v. American Home Products, Inc. and Department of the Interior v. South Dakota, 76 N.C. L. Rev. 1387 (1998); and Sena Ku, Comment, The Supreme Court’s GVR Power: Drawing a Line Between Deference and Control, 102 Nw. U. L. Rev. 383 (2008). These pieces are generally critical of the GVR, but none addresses the GVR as one component of a broader trend in the Court’s use of summary disposition. Tyler v. Cain, 533 U.S. 656, 666 n.6 (2001) (per curiam) (quoting Lawrence v. Chater, 516 U.S. 163, 167 (1996) (per curiam)). Robert A. Leflar, Internal Operating Procedures of Appellate Courts 3 (1976). See generally Arthur D. Hellman, Error Correction, Lawmaking, and the Supreme Court’s Exercise of Discretionary Review, 44 U. Pitt. L. Rev. 795 (1983) (examining Supreme Court decisionmaking through the lens of these two capacities). Chief Justice Fred M. Vinson, Work of the Federal Courts, Address Before the American Bar Association (Sept. 7, 1949), in 69 S. Ct. v, vi (1949). See Timothy S. Bishop, Jeffrey W. Sarles & Stephen J. Kane, Tips on Petitioning for and Opposing Certiorari in the U.S. Supreme Court, Litigation, Winter 2008, at 26, 26 (noting that certiorari petitions “more than doubled” from the mid-1970s to 2006); see also Andrew B. Coan, Judicial Capacity and the Substance of Constitutional Law, 122 Yale L.J. 422 (2012) (arguing that judicial capacity helps to explain the substance of certain Supreme Court decisions). Vikram David Amar, The Supreme Court’s First Ruling of the New Term, Cavazos v. Smith: Supreme Court Annoyance, the Ninth Circuit, and Summary Reversals, Verdict (Nov. 11, 2011), http://verdict.justia.com/2011/11/11/the-supreme-courts-first-ruling-of-the-new-term-cavazos-v-smith. Kevin Russell, An Increase in the Court’s Summary Docket, SCOTUSblog (Feb. 16, 2010, 11:13 AM), http://www.scotusblog.com/2010/02/an-increase-in-the-court%E2%80%99s-summary-docket. Ira P. Robbins, Hiding Behind the Cloak of Invisibility: The Supreme Court and Per Curiam Opinions, 86 Tul. L. Rev. 1197, 1207 (2012). Professor Robbins’s primary concern is with the anonymity that characterizes these opinions, rather than the process that lies behind them; he argues that the per curiam is at odds with the tradition of individuality that characterizes the American judicial system and contends it should be limited to “situations in which courts use only formulaic, boilerplate language to dispose of the matter before it.” Id. at 1241. This growth is apparent when this proportion is measured as a three-year rolling average. The proportion of per curiam dispositions has actually varied dramatically, ranging from five percent in 2006 to sixteen percent in 2009. The data in this Essay are drawn from two sources. Longitudinal comparisons, including Figure 1, rely on the Supreme Court Database, a multiuser database created by Professor Harold Spaeth. Sup. Ct. Database, http://scdb.wustl.edu/index.php (last updated Sept. 13, 2012). More detailed data about the Roberts Court, including its use of GVRs, are drawn from an examination of all merits opinions and order lists issued by the Court since the 2005 Term. See Orders and Journal, Sup. Ct. of the U.S., http://www.supremecourt.gov/orders/orders.aspx (last visited Dec. 20, 2012) (providing orders and opinions relating to orders dating back to the 2003 Term). I have not provided individual citations for these data points. There is at least a plausible argument that the Warren Court’s approach to summary disposition reflected Chief Justice Warren’s personal commitment to doing justice to the parties: “There are many instances where the Court, without granting plenary review, has summarily reversed, remanded, or taken other direct action to achieve what the justices conceived to be essential justice. . . . The Court [must] be in position to test every case . . . to see if justice has truly been done.” Retired Chief Justice Warren Attacks, Chief Justice Burger Defends Freund Study Group’s Composition and Proposal, 59 A.B.A. J. 721, 729-30 (1973) (quoting retired Chief Justice Warren). “Summary disposition” is defined as per curiam opinions issued without briefing or merits arguments (not GVRs). The heavy line represents the three-year rolling average; the light line represents actual data. These data are drawn from Sup. Ct. Database, supra note 24. This is the phrase generally used by the Court to indicate the reason for a GVR. See, e.g., Oakley v. City of Memphis, 557 U.S. 930, 930 (2008) (granting, vacating, and remanding “for further consideration in light of Ricci v. DeStefano”). Because the Supreme Court Database does not include GVRs, I have adopted the 1975 to 1979 Terms as my point of comparison. Professor Hellman provides a table of figures for these terms in his article. Hellman, supra note 15, at 804-05. In the 2006 Term, the Supreme Court issued more than 260 GVRs, the vast majority of which remanded cases to the lower courts in light of Booker and Cunningham v. California, 549 U.S. 270 (2007), which held that the same principle applied to state sentencing guidelines. See Hellman, supra note 11, at 390 (explaining that GVRs instruct lower courts to reconsider their rulings “‘in light of’ a Supreme Court decision handed down after the lower court’s ruling”); see also Henry v. City of Rock Hill, 376 U.S. 776, 776 (1964) (per curiam) (“[Issuance of GVRs] has been our practice in analogous situations where, not certain that the case was free from all obstacles to reversal on an intervening precedent, we remand the case to the state court for reconsideration.”). Webster, 130 S. Ct. at 457 (Scalia, J., dissenting) (“We should at least give it a new and honest name—not GVR, but perhaps SRMEOPR: Summary Remand for a More Extensive Opinion than Petitioner Requested. If the acronym is ugly, so is the monster.”). The Court has issued GVRs based on the government’s confession of error since at least 1981, a habit that has drawn fire from Justice Scalia, Chief Justice Rehnquist, and others. See, e.g., Mariscal v. United States, 449 U.S. 405, 406 (1981) (Rehnquist, J., dissenting). Indeed, unlike Chief Justice Rehnquist, who often joined Justice Scalia in dissent, Chief Justice Roberts has not yet dissented from a GVR. See, e.g., United States v. Johnston, 268 U.S. 220, 227 (1925) (“We do not grant a certiorari to review evidence and discuss specific facts.”); see also Kyles v. Whitley, 514 U.S. 419, 456-60 (1995) (Scalia, J., dissenting) (reviewing the Court’s history of certiorari grants in fact-bound cases and concluding that they are “precisely the type of case in which we are most inclined to deny certiorari”). Amar, supra note 19 (“[T]he ruling revealed some interesting things about how the Supreme Court reacts when it is frustrated over what it considers disobedience by lower courts—in particular, perhaps, the . . . Ninth Circuit.”). Cavazos, 132 S. Ct. at 12 (Ginsburg, J., dissenting). There is a cottage industry of speculation about the Ninth Circuit’s reversal rate at the Supreme Court. See, e.g., Marybeth Herald, Reversed, Vacated, and Split: The Supreme Court, the Ninth Circuit, and the Congress, 77 Or. L. Rev. 405 (1998); Richard A. Posner, Is the Ninth Circuit Too Large? A Statistical Study of Judicial Quality, 29 J. Legal Stud. 711 (2000); Kevin M. Scott, Supreme Court Reversals of the Ninth Circuit, 48 Ariz. L. Rev. 341 (2006). Antiterrorism and Effective Death Penalty Act of 1996, § 104, Pub. L. No. 104-132, 110 Stat. 1214, 1218-19 (codified at 28 U.S.C. § 2254 (2006)). The Court has faced accusations before that it uses summary disposition more often to defeat claims by convicted criminals than to sustain them. See, e.g., Florida v. Meyers, 466 U.S. 380, 386 (1984) (Stevens, J., dissenting) (noting that, in three Terms, the Court had not once used summary disposition to protect “the constitutional rights of persons accused or convicted of crimes”). See Kyles v. Whitley, 514 U.S. 419, 456 (1995) (Scalia, J., dissenting) (“[W]hen the petitioner claims only that a concededly correct view of the law was incorrectly applied to the facts, certiorari should generally . . . be denied.”). Nancy J. King, Non-Capital Habeas Cases After Appellate Review: An Empirical Analysis, 24 Fed. Sent’g Rep. 308, 317 (2012). Some have even acknowledged as much. See Vance v. Rumsfeld, Nos. 10-1687, 10-2442, 2012 WL 4516500, at *13 (7th Cir. Nov. 7, 2012) (en banc) (Wood, J., concurring in the judgment) (noting the use of summary reversals in the habeas corpus context and concluding that “the Court does not hesitate to step in and correct lower courts that have strayed beyond the boundaries it has established”). Hutto v. Davis, 454 U.S. 370, 387 (1982) (Brennan, J., dissenting); cf. Bunkley v. Florida, 538 U.S. 835, 842 (2003) (Rehnquist, C.J., dissenting) (arguing that summary disposition is improper when it “makes new law”). Id. at 725 (Thomas, J., dissenting). Justice Thomas also noted that the Second Circuit had struggled with the question presented in Presley, and that judges on the en banc panel had reached at least three different conclusions. Id. at 727 (citing Ayala v. Speckard, 131 F.3d 62 (2d Cir. 1997) (en banc)). 555 U.S. 261 (2009) (per curiam). The Spears Court splintered, with five votes to summarily reverse; one vote, Justice Kennedy’s, to grant oral argument; and Chief Justice Roberts, joined by Justices Thomas and Alito, dissenting. The dissent noted that two other courts of appeals had agreed with the Eighth Circuit, and argued that “[t]his is not the stuff of summary reversal.” Id. at 269 (Roberts, C.J., dissenting). See id. at 1178 (holding that “the Fourth Circuit has strayed from the clear holding of this Court” in Hudson v. McMillian, 503 U.S. 1 (1992)). The Fourth Circuit had held in Riley v. Dorton, 115 F.3d 1159 (4th Cir. ), cert. denied, 522 U.S. 1030 (1997), that prisoners filing suit under § 1983 and alleging excessive force cannot prevail if their injuries are de minimis; over 300 district-court opinions cited Riley in the fifteen years between that case and the Court’s rejection of the Fourth Circuit position in Wilkins. The Fifth Circuit has arguably adopted a similar requirement. See Wilkins, 130 S. Ct. at 1179 n.2. See Fed. R. App. P. 34(a)(2) (“Oral argument must be allowed in every case unless a panel of three judges who have examined the briefs and record unanimously agrees that oral argument is unnecessary . . . .” (emphasis added)). At some point, it was generally understood that summary reversal required at least six votes. See Gressman et al., supra note 8, at 343. That internal operating rule is evidently no longer in effect.